The Westmont Fire Department celebrated its 95th Anniversary and Fire Prevention Open House at the Johanik Fire Department Headquarters on Saturday, October 13. 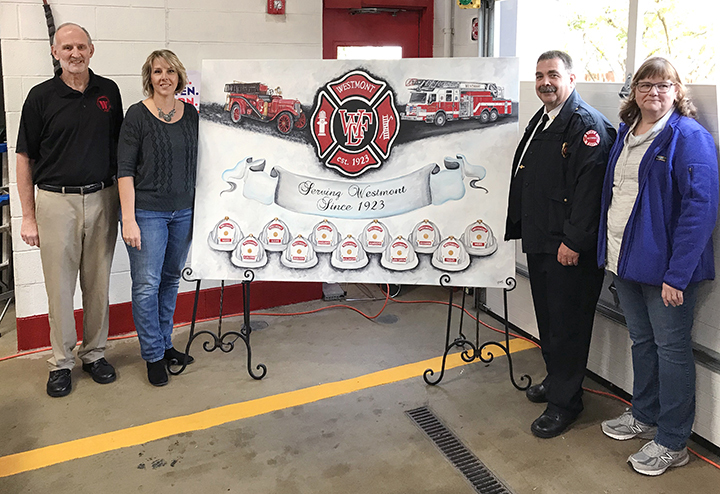 The event featured fire safety presentations, a collection of newly created Fire Department historical scrapbooks, and the unveiling of a new Westmont Fire Department mural. Chief Weiss introduced guest speakers Mayor Ron Gunter and Trustee Marie Johanik-Guzzo who then assisted with the unveiling of the anniversary mural. The mural features 11 fire department helmets with the names of each Fire Chief as well as the first fire truck purchased by the Village of Westmont in the early 1920’s and the most current fire engine number 183. The mural will be hung in the foyer of the Johanik Fire Department Headquarters at 6015 S. Cass Avenue. During Trustee Guzzo’s remarks, she described growing up as the daughter of the Westmont Fire Chief. Her father was involved with the Westmont Fire Department for four decades serving from the 1950’s through the 1990’s. The event also featured the debut of five Fire Department historical scrapbooks that were coordinated by Diane Weiss, wife of Chief Weiss. The scrapbooks showcase historical photos and news clippings from the beginning of the department through present. The scrapbooks will be on display at the Village Hall on the second floor through the end of October, along with a display case of Fire Department historical memorabilia. Pictures from the event can be found in the Village of Westmont’s website photo gallery at Fire Dept. Anniversary Photo Gallery. For more information regarding the Westmont Fire Department, call 630-981-6400.